1. 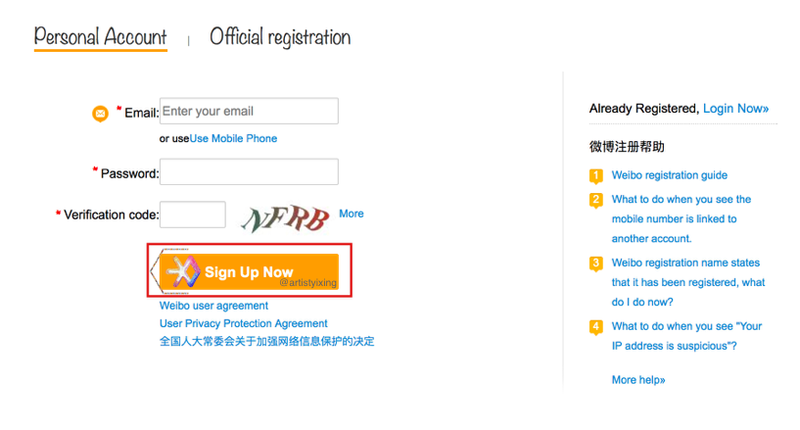 With your preferred browser*, click here to open the Weibo sign-up page on a new window. Make sure you are in the “Personal Account” section of this registration page. *Note: Google Chrome is easier because it can translate the entire page. 2. Fill out the required sections. Although there is an option to use your phone number, use your email address instead. When you are done, click the “Sign Up Now” button. 3. Verify your information by entering your phone number. Look for your country** so the area code is correct. **Note: your country may not be listed. In that case, you cannot register using desktop/pc method. 4. Click the “Get A-Code for free” button In a couple of seconds, you will get a text message with a four digit number. 5. Enter that code in the box to the right of the button then click “Submit”. 6. Enter all of the information for the required fields. Your nickname will also be your username and this isn’t permanent – you can change it whenever you want. For location, you have two options: (a) Put your location as “Others” or (b) Put your location as “Overseas” and then you can select a country – either way will work. 7. Click the orange box on the bottom to continue. 8. The same pop up box from steps 3 - 5 will appear, asking for verification. Follow the same steps. 9. This is the last step of registration. In order to continue, you must choose at least one interest. When you’ve selected at least one, click the “Enter” box and you will be directed to your homepage.